Bring dinosaurs into your primary math lessons with Dinosaur Counting and Sequencing 1 - 20. 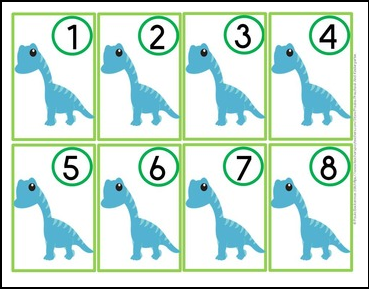 Directions include many suggestions for use, including games in the style of Go Fish, Concentration, Snap and War, or just have your students put the dinosaur numbers in order. There is also an addition mat and recording sheet - lots of fun dinosaur themed learning! - recording sheet for addition problems.